On Thursday evening, 23 November, Start360 and Include Youth's Employability Service, in partnership with the Belfast Trust, won second place at the Chairman's Awards. 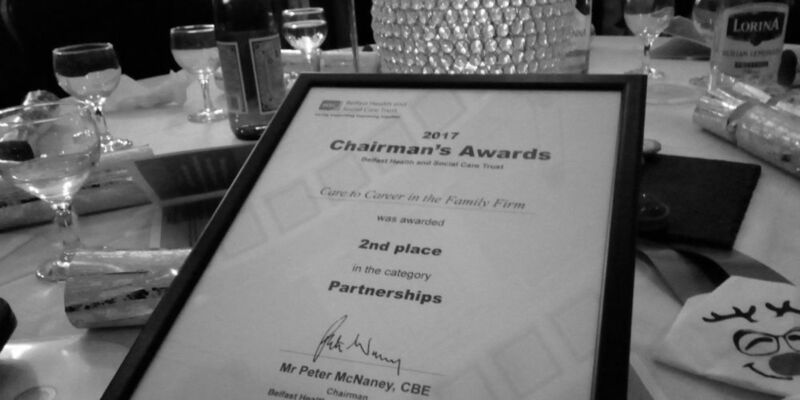 We submitted an entry to the awards under the project name of 'Care to Career in the Family Firm', highlighting the work we do with young people leaving care and the importance of their ongoing links with the Trust. The Awards took place at Belfast City Hall. Peter McNaney, Chair of the Belfast Trust, presented the awards and described all the staff in the room as 'epic'. We'd also like to congratulate the winners in our category, from the Regional Spinal Service.